LOVE THE GREAT OUTDOORS? PREFER TO BE INDOORS? Either way - we've got you covered! Does agility or dock diving have your fancy? Then our Teamwork module is for you. You will learn how to “shape” behaviors in this module. When you know how to shape a new behavior , you will be ready to teach your dog any behavior you want - for the rest of his life. 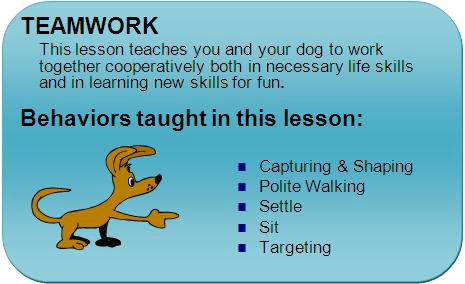 You not only learn behaviors in Cyber Dog, you learn training skills that apply to any situation. Our modules are designed for inside humans and dogs too. Thinking of training for a therapy dog status? Then the Self Control module is meant for you. 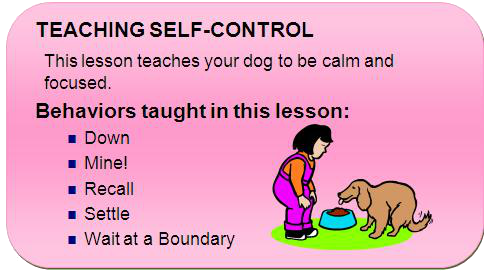 Your dog will learn how to wait, settle and lie down. Imagine being able to take your polite dog to work with you. 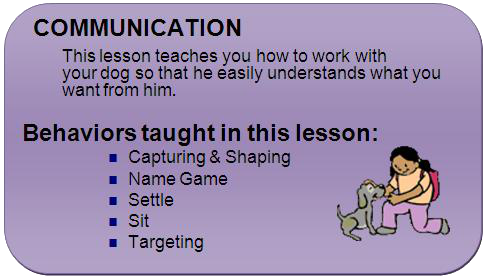 The behaviors in our Communication module will help prepare your dog for the office, the sales counter or other work environments. 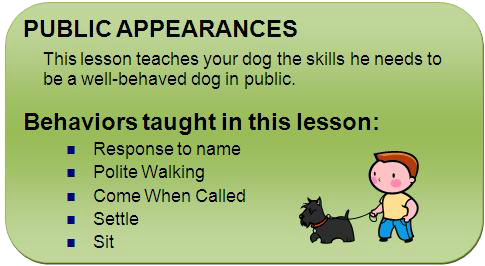 Settling on a mat is a good foundation skill - you can tuck your dog under your desk as you go about your work. 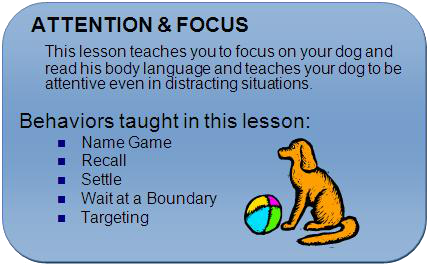 Whether you like to be indoors or out, the Attention and Focus module provides a great set of behaviors to start you and your dog off to a fun, rewarding life together. Imagine your dog sitting and waiting patiently for his dinner or to go out the door. When you call, it will become second nature for your dog to come running. Capturing & Shaping - powerful training tools to start new behaviors! Mine! - the art of self-control! Polite Walking - who wouldn't love to have that! Targeting - another great tool for use in everyday life! It is so nice to share your life with a well mannered dog!